I had pulled off the interstate into a small and sad West Texas dust town. I saw her about a half mile before we came to the stop sign. For selfish reasons I changed lanes so as not have to pull to a stop right beside her. I wanted a good excuse for the avoidance, like I only had big bills, as if that would be a prudent excuse. I had no real rational other than to just not have to see her. I just didn’t want to deal with a panhandler. On coming traffic made me stay until the uncomfortableness of not looking at her grew. I stole a quick glance at her. Actually I locked my eyes on her hand scribbled cardboard sign. 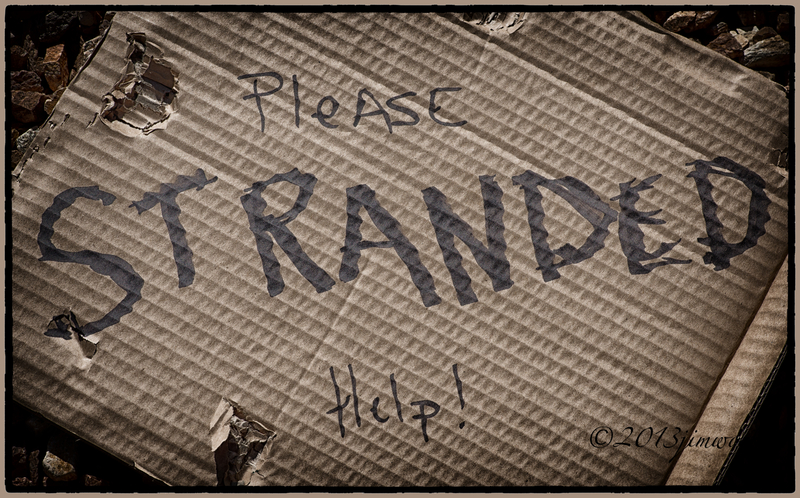 In large shaken hand lettering it read simply “stranded”. There were some other smaller words around it but I could not read it a lane away. I tried so hard to keep my eyes fixed on the sign. My eyes went quickly to her washed out blue eyes. She held a 100 mile stare along with the sign. Salt and pepper hair was neatly bound in a short excuse of a ponytail. Wrinkles about her squinting eyes showed we shared the same age. Dressed neatly, no baggage except what she carried unseen. Neatly pressed and folded. She could and probably was someone’s grandmother. What had happened so as to be left stranded along a road? The traffic cleared and my hurried look was thankfully ended, but the shutter of the minds eye had burned a memory. I had looked at her for maybe 1/2 a second. I make images all the time at a 1/250th of a second, sometimes even shorter and faster portions of time. A small slice of life and the unseen. Whole stories are held in the briefest of an exposure. So why am I so amazed that this image was seared onto my internal memory card. It was Valentines day, I took my wife to lunch at a little diner, less than a block away from the stranded lady. I tried to delete the image, I needed it erased, wiped from my hard drive. We ate, but I kept replaying that scene. It felt much like when you find a washed out photograph, and you have no idea who the people are. You just know that they are somebody, family. I planned to go back to her after my lunch. A chance to identify the people in the found photo, to hear her story. I drove back to the corner, but all that was there was trash and dust blowing around in an endless circle. I went closer but even her shadow was gone. I looked helplessly for her cardboard sign. I needed it, I was the stranded one now. Wow a photographer and an amazing writer. Love your work.